Indian direct to home TV DTH service provider Videocon D2H 4K STB Review. stunning visuals, but wait for more Television channels to come in 4K picture quality. 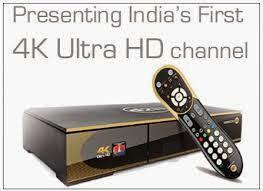 Videocon 4K set-top-box seems like a good upgrade option for those planning to buy a 4K television set this year. We have been hearing about 4K or Ultra HD for a couple of years. But even as 4K TVs are cheaper and smaller, there is still a serious shortage of 4K picture quality content and TV channels in best Full HD resolutions. All of the best players of DTH in India have launched 4K set-top boxes which are capable of streaming of 4K quality content, provided it is available in the real sense. Here is our review of the Videocon D2H 4K set-top-box. Videocon launched its 4K service just before the ICC Cricket World Cup and ceilings with a channel with some of the parties in 4K. However, the World Cup does not seem to have had the desired push for 4K content and TV. I hope this makes really out around the Olympic Games next year, when 4K could well become the standard FullHD. The price of Videocon 4K STB is Rs 6590 for 4K Set-top-box+ STB installation. 4K STB seems a little bigger than normal set-top boxes and has a regular Gold brand that is hard to miss. Videocon perhaps suggest that this is the gold standard for the content of television at the time. The remote also has the mark of gold. It is easy to grip and navigate, which is important for remote these days. There is a HDMI port on the back that attaches to the TV. What I like the Videocon service is the fact that the box changes TV channels almost instantly and no latency as can be seen in other STB. Yes, you have a 4K expensive TV. Yes, you have a 4K expensive set top box. But still there are shortage of 4K content and TV channels in 4K full HD. Videocon has a channel service that constantly telecasts 4K content. But there is a limit to the amount of snow boarding can be seen entire day. The entire channel is sung repetition plays the same videos in a loop. However, it is a great showcase of what 4K offers. I have always considered 4K content a little better than what the human eye sees and there is something strangely ethereal about watching the images so clear. And Videocon D2H 4K gives you a good look at what the future of television has for us. It's amazing. For the record, I tested the service in a 55-inch Philips 8500 series. At this time the only channel is easily accessible in one click. But maybe when more channels will come, the user interface must show that most users with 4K set top box. They do not want to see the content even in Full HD, 4K TVs and the experience of 4K content is far from good. Maybe not now. At the moment, it makes little sense for you to buy 4K STB unless you've already invested in a 4K TV. For those planning to buy a 4K television this year, Videocon d2h dth seems like a good upgrade option for them.